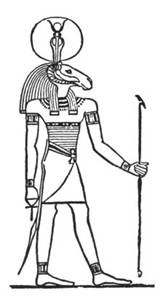 In Ancient Egypt animals were shown as manifestations of gods. The Ram was considered a temple animal even though for other cultures sheeps would not be consider as clean animals. It was mainly venerated for its fertility and warlike attributes. In this image is possible to see all the features that the Ram had. Excavations at Mendes have exposed a temple and many pictures and sculptures from the Ram God.